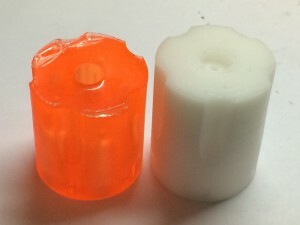 In Part 7 of my series on the making of the Wall-Saver safety cylinder, I discussed how I overcame shrinkage problems, but immediately ran into difficulty with the dimensionally-excellent mold I had made from it. The big one—getting a complete cylinder without bubbles—was solved entirely by accident. Once, I poured an experiment into the mold, and the plastic actually started to cure in the funnel itself, leading to a cylinder that was missing a big chunk of the top. After I got it out and finished cursing I realized—I don’t NEED the top! As long as the back end and the center hole are correct, it fits the gun fine, and the extra gap doesn’t affect operation at all. (I wrote about this once before). Now, to make the top even it would need to be machined, and that is an extra time-consuming step. But compared to the waste of plastic and time from defective mold pours, it’s well worth it. The “defective” cylinder that solved the problem of bubbles. In addition, the open-top method meant that my struggle to get just the right length center rod—and to extract it successfully—was over. An overly long rod that is easily grabbed by pliers to twist and extract ended that particular fight. The other problem—a poorly designed opening for the extractor rod—required the creation of a new mold master. That was a pain, especially having to re-do the time-consuming machining of the new one, with the associated stress of hoping the later operations go smoothly and don’t mess up several hours of work. But it did, actually, and it was then easy to create a series of new molds with the new design. The new molds incorporated several changes. since it was my intent to support the center rod only from the bottom, I used a 1/8” brass rod rather than the 1/16” that had gone before, and two plywood reinforcements instead of one to help with rigidity. I also concocted a scheme to mold little center rods in to each chamber, so that the springs that would be inserted would have something to hold them in position. This was done by using 1/8” brass down the center of each chamber, and then withdrawing it slightly to make a cavity before pouring plastic into it. The final (really final this time!) cylinder mold master, and how it was prepared for pouring the final molds. 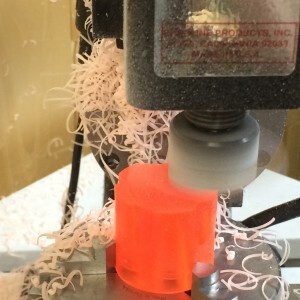 After the first mold was poured and cured, it was tested—and it seemed to work! So I went straight to production, pouring 7 identical molds, which I thought was the number that would fit in the pressure pot used to suppress bubbles in the final product (It turns out that 8 would fit, but I ran out of silicone). But the problems weren’t over yet. More on that next time. Get a Wall-Saver safety cylinder today!